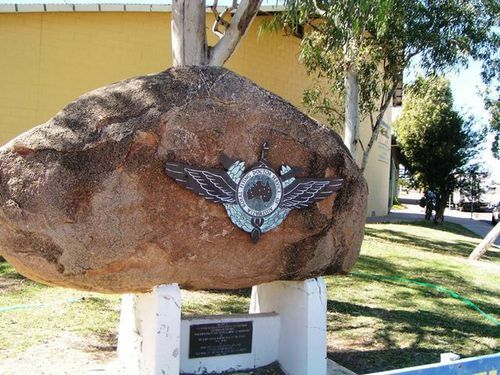 The memorial commemorates the establishment of the first Flying Doctor Base in the world by the Reverend John Flynn in 1928. On 9 September 1928 the Aerial Medical Service was established at Cloncurry. The site was chosen because the area was made up of scattered settlers and small townships, while Cloncurry had a well equipped aerodrome, a basic telegraph and telephone and a 40 bed hospital; with a resident Medical Officer. Dr. K. St Vincent Welch was appointed as the first flying doctor. A single engine DH50 was chartered from QANTAS, modified to carry a stretcher. QANTAS also assigned a pilot, Arthur Affleck to the service. In 1941 the name was changed to the Flying Doctor Service and in 1955 it was granted the prefix Royal. There are now 14 bases and 29000 outposts across Australia realizing Flynn's dream of "A mantle of safety over the inland." ONE MAN, AND ONE ALONE, PERCEIVED THE WAY".